DINE, master developer of Punta Mita, and JLL (Jones Lang LaSalle) are pleased to announce the last phase of Las Marietas. 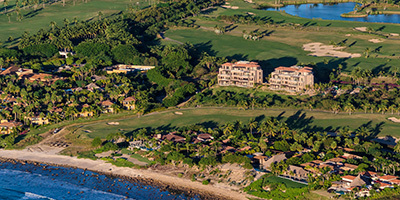 An elite enclave of only 42 residences located adjacent to the 18th hole of the Jack Nicklaus Signature Bahia golf course and named for its incredible views across the Pacific Ocean to the Marietas Islands. Comprised of seven residences per building, only two per lever with elevator access, underground parking and owner’s storage space. All buildings will share a centrally located recreational facilities featuring a styled swimming pool fitness center and BBQ area for you to enjoy the art of living well. These condominiums offer easy tropical sophistication with spacious 3-bedroom and 4-bedroom floor plans, lock-offs for guest facilities, dual master suites, captivating ocean views and private infinity-edge plunge pools. Owners at Las Marietas also enjoy exclusive access to the Sea Breeze Beach Club at The St. Regis Punta Mita Resort, for perfect Punta Mita lifestyle. This project has been so well-received that only two years after launch, construction is drawing to a close and only a few select units remain available for sale, making this the final opportunity to invest in these spectacular residences.